JooTube.TV: Amb. Michael Oren, MK, addresses Shimon Peres' legacy on night of promoting Druze veteran cause in L.A.
Amb. 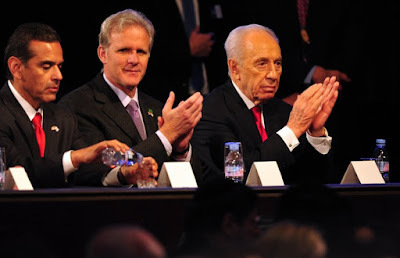 Michael Oren, MK, addresses Shimon Peres' legacy on night of promoting Druze veteran cause in L.A.
On the night of Shimon Peres' death, September 27th in L.A. MK Michael Oren (Kulanu party) remarks on the life of Shimon Peres and Druze-Israeli contributions to Israel and her stability. Presentation at Beth Jacob Congregation of Beverly Hills. Ambassador Oren responds to audience questions about (among other things) the difference between Israel and Obama's beliefs regarding Islamist Iran and other topics, some of which he addressed in his revelatory book, "Ally," which exposed Democrat administration duplicity towards Americans' longtime ally, Israel.